Our first iOS title is now available in the App Store! On Friday, Apple approved A Little Solitaire, our first Solitaire game for iPad (of several), and it is now available in the App Store for only 99 cents! 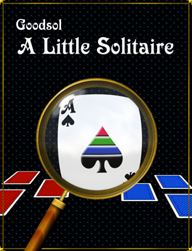 A Little Solitaire is, as suggested by the name, a small collection with 9 of the most popular computer Solitaire games. This includes Klondike (a.k.a., Solitaire) [4 variants], FreeCell [2 variants], and Spider, with its Spider One Suit (easy) and Spider Two Suits (average) variants. The product includes 3 different card sets, as well as 16 back designs, and features all of the quality gameplay you expect from Goodsol Development (and our implementation 🙂 ). This makes me feel that the effort to make a quality game was appreciated. A mediocre review based solely on games that a reviewer would rather have… not so much. Check it out, and please let us know what you think.